The dog days of summer are drawing to a close, cool nights and warm, sunny August days. These are perfect days for working in the garden. I don’t get the required amount of sunlight in my backyard to allow me to grow vegetables, so I just plant herbs, and often cherry tomatoes. Isn’t it it exciting though when friends show up with a load of fresh produce from their garden and leave it on your porch? The past couple of years I’ve been very fortunate with my good friends doing just that. I had the opportunity to visit my friend’s Dad’s orchard this past July 4th, and what I saw was absolutely amazing! Four acres with rows and rows of peppers, cucumbers, eggplant, squash, tomatoes, pumpkins, zucchini and fruit. A lot of hard work tending to these fruit and vegetables and it was all lovingly cared for. With the past harsh winter that we experienced, they lost quite a few of their fig trees, so I was not able to bake the Upside Down Fig Cake that I have made with the figs in previous years. After all that tender loving care that went into them, I thought I could whip up a few dishes with some family favorites and some new ones to try. Today, I present to you, Garden Fresh Spaghetti Sauce, Eggplant Gratin, and Zucchini Ribbons with Fresh Dill, Mint and Feta. Summer’s bounty was surely put to good use. Discard any grease in pot. Drizzle in olive oil. 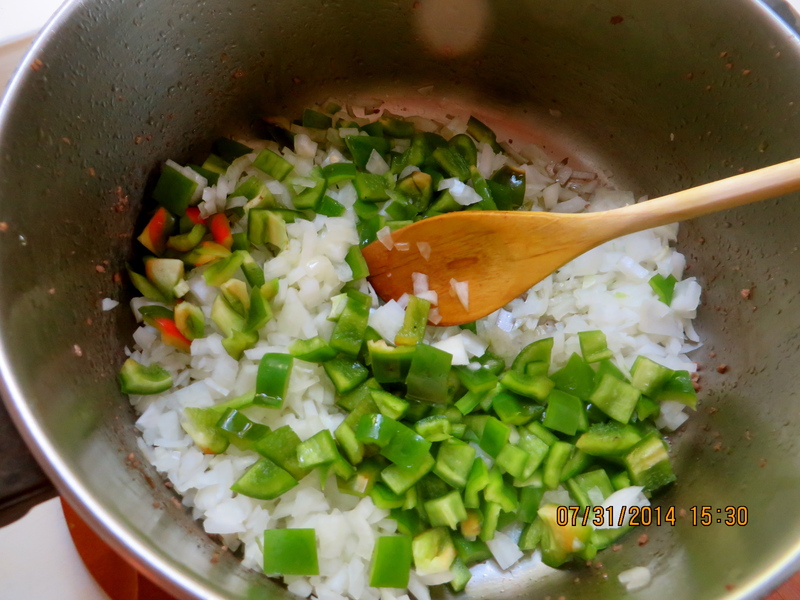 When it is heated, throw in the diced onion, bacon and diced bell pepper. 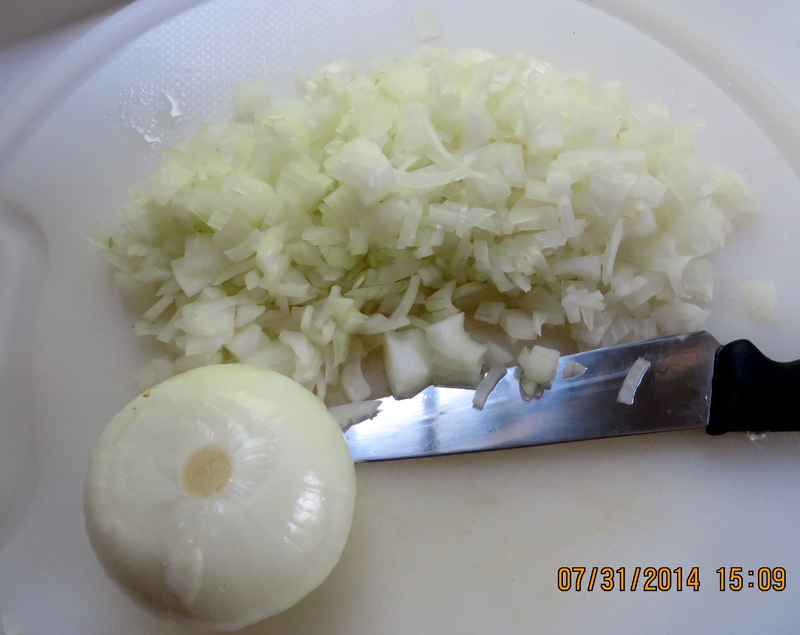 Stir it around for a couple minutes, then add the garlic, stir and cook for an additional minute. 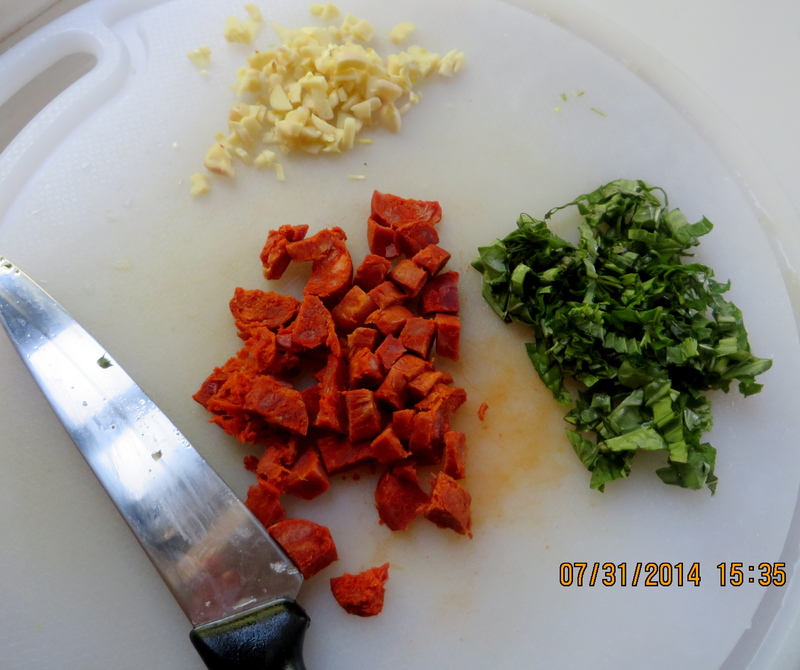 My secret ingredient is chorizo, cube a link of chorizo and add it to the pot. 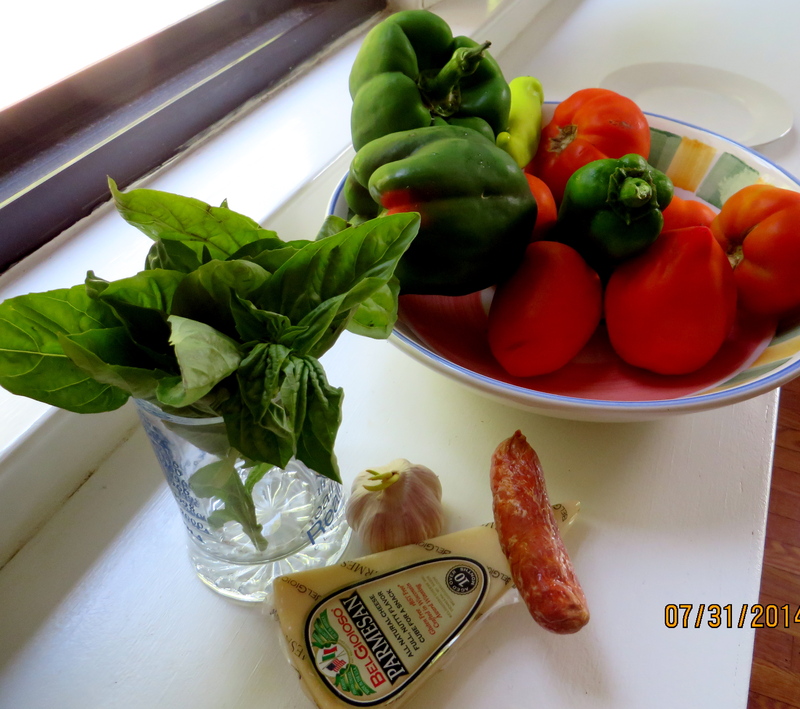 At this point I chopped up some fresh basil and added it to the mix too. 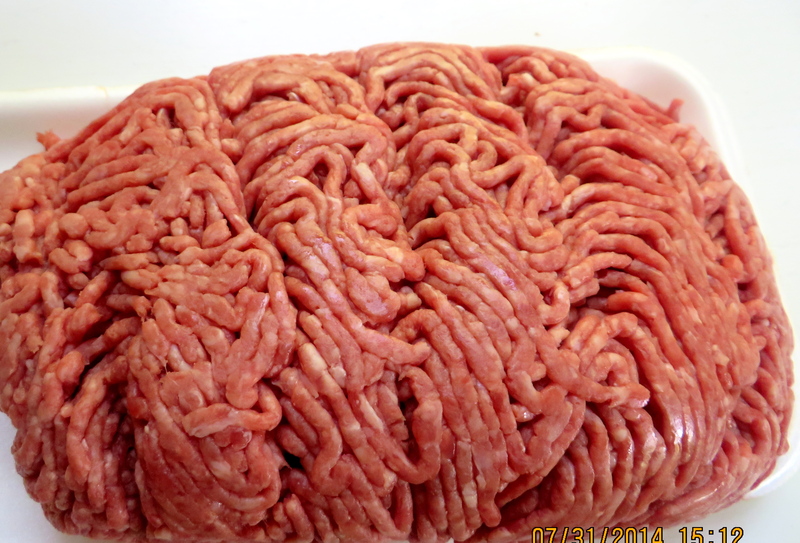 Add the browned meat and let it absorb all the flavors. Blanch, then rough chop the tomatoes. (You do this by cutting an X at the stem end of each tomato, pour boiling water and let it stand for about 3-4 minutes until you see the skin begin to loosen. 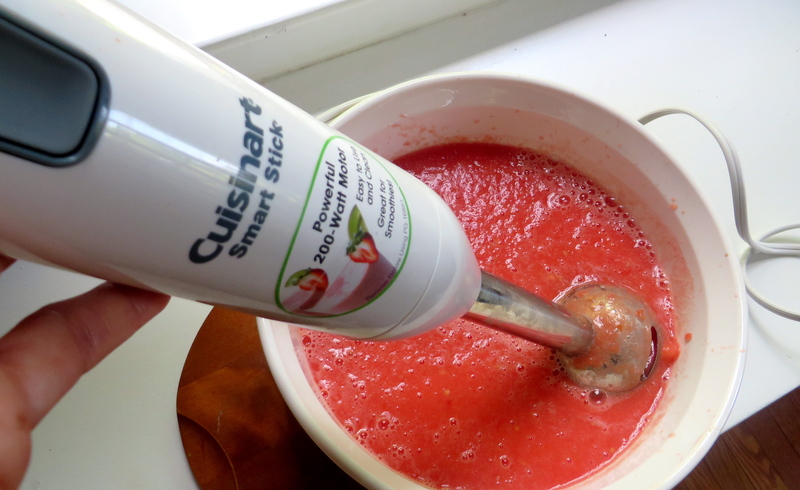 Peel at the X.
I decided to use the Cuisinart stick to crush the tomatoes and give the sauce a smoother consistency. 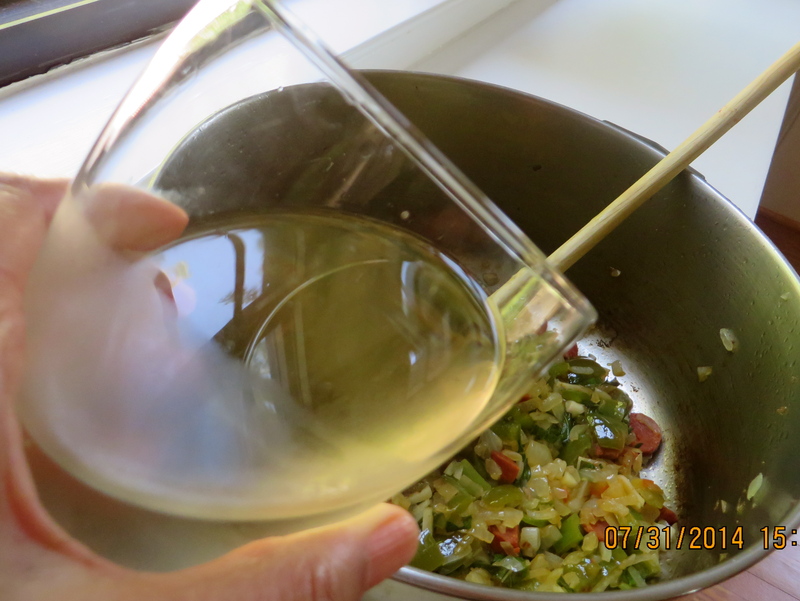 Back to the pot and sautéing the vegetables and ground beef…now add some white wine (a couple of glugs for me) stir this around for a couple of minutes. 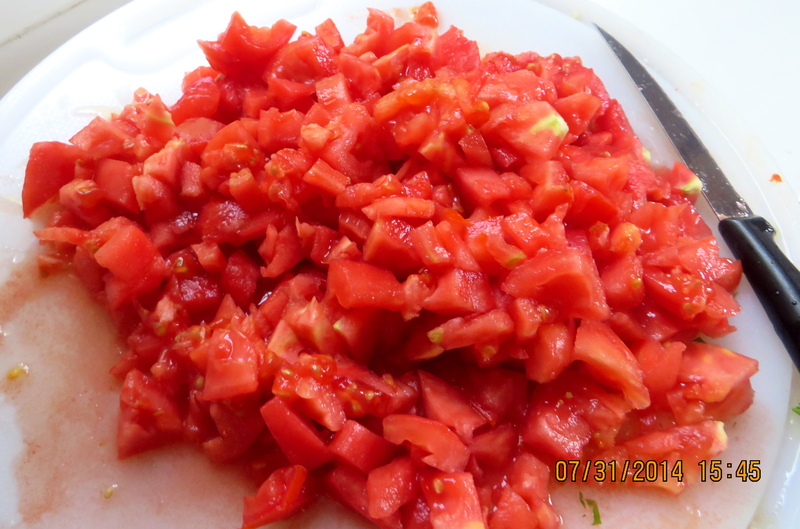 Next I added the crushed tomatoes and dry spices…. tomato paste, oregano, Italian seasoning, thyme, salt, bay leaves and some more basil. Cut a wedge of the parmesan cheese and throw it in the pot for added flavor. 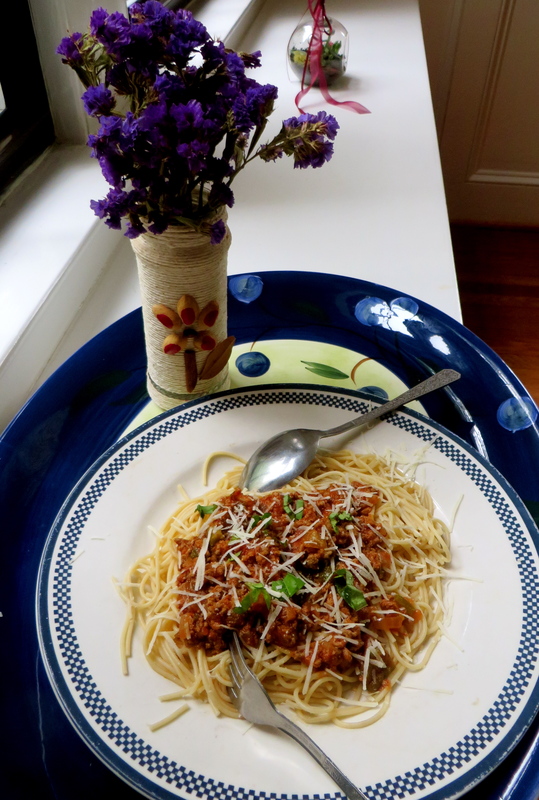 Grate some parmesan cheese and sprinkle with fresh parsley…. 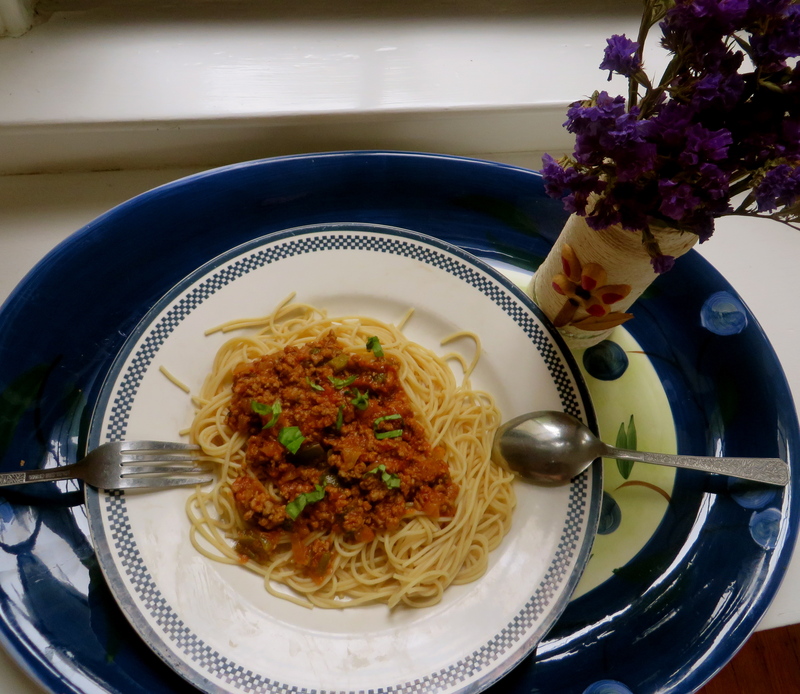 and there you have it, about 3 meals of spaghetti and meat sauce with plenty of leftovers. I’m bringing Summer’s bounty to Angie’s Fiesta Friday #31 – it is a linky party where folks from far and wide share their recipes, and ideas. Go on, click on the link to find out more. It all looks so delicious, Loretta! 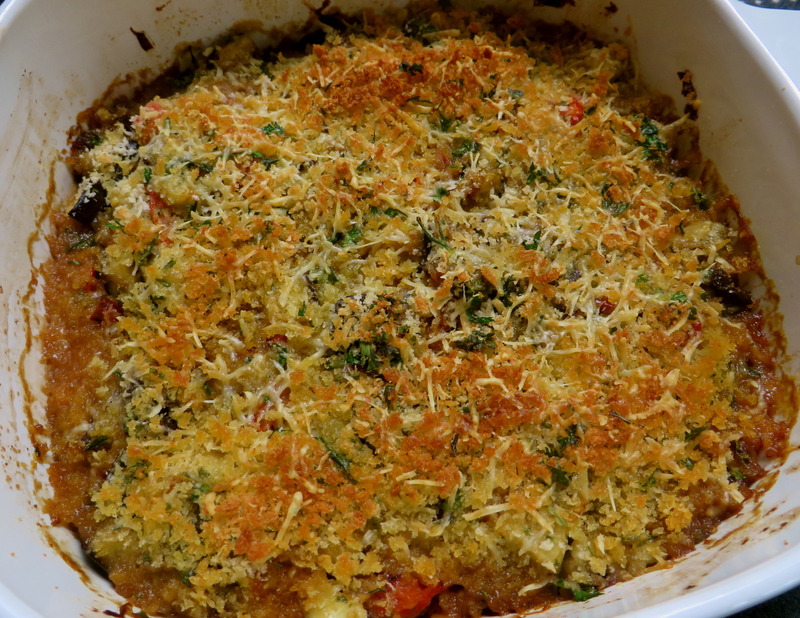 I like that you added a lump of parmesan to the sauce for extra flavour – I always save my rinds in the freezer for minestrone but will now add them to a meat sauce too! How lovely to come home to a vegetable bounty on your porch and how wonderful to have your friend’s father’s orchard to enjoy too! Have a wonderful weekend! Thanks Selma, it really was quite delicious. I try to add a lot of spicy ingredients to make the sauce more flavorful, and it did pack a mean punch :). I’ll have to start saving my rinds in the freezer too. I sent you an email about 2-3 days ago, did you receive it? Yes you are lucky to have such friends! That gratin looks amazing, I must say! Happy FF and have a wonderful weekend! Thanks Sue, yes indeed I am very fortunate to have friends who share :). 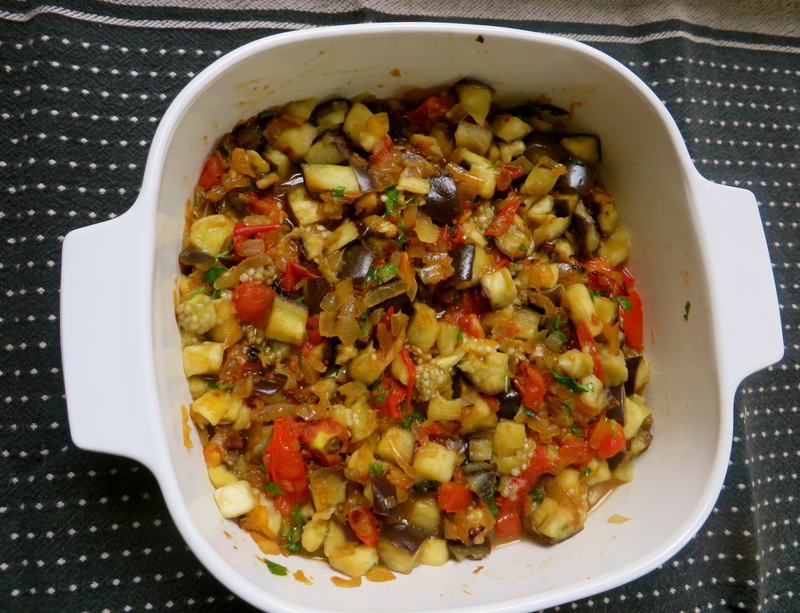 You’ll have to give the gratin a try, I had never tried it with eggplant before, and I must say it was very good. Thanks so much Anjana, and a Happy Fiesta Friday to you. Enjoy your weekend. That looks like my CSA basket this week. That sauce looks delicious and I think I’ll serve mind over zucchini noodles. Thanks for the idea. Thanks Tracey, a great idea serving it over zucchini noodles, I’d like that too, but not sure hubby would agree 🙂 Enjoy the weekend! Thanks Lori, I think spaghetti and meat sauce would be ok for breakfast? I mean that way you could skip lunch :). Enjoy your weekend. Oh yum, what a delicious spread you’ve brought to us all. Happy Fiesta Friday. Thanks so much, I hope there was enough for everyone. Happy FF! Beautiful post! I have some of these awesome veggies in my garden.. and I was looking for new recipes. This is perfect. Thanks for sharing! Happy FF! Thank you Lisa. Let me know how they turn out. This is a great time to use up all those veggies before the cooler weather sets in. Happy FF! You are lucky to have friends who share their harvest with you, but I expect they are also happy to know that their gifts are being used in such delicious ways. Lovely recipes all, but I particularly like that zucchini ribbon one. Now on my to-do list. 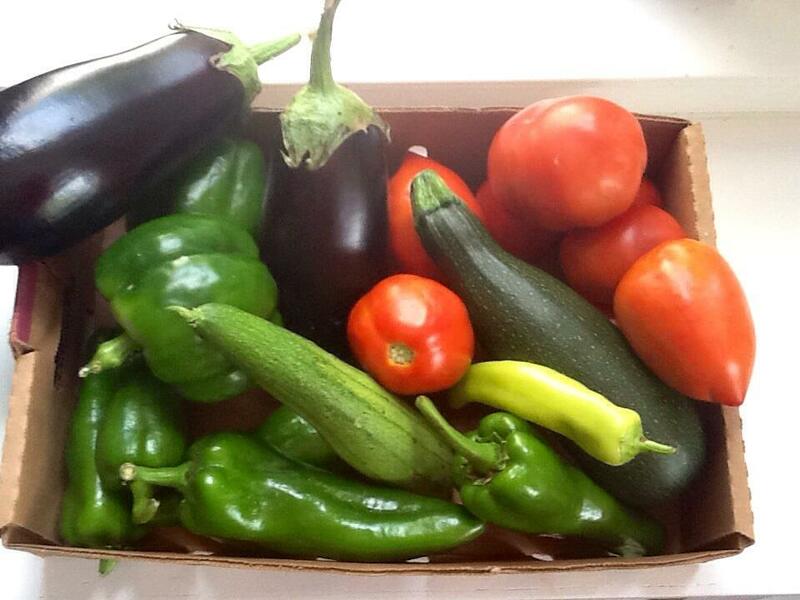 You made such good use of the garden-fresh produce Loretta! That sauce and the final dish look incredible! 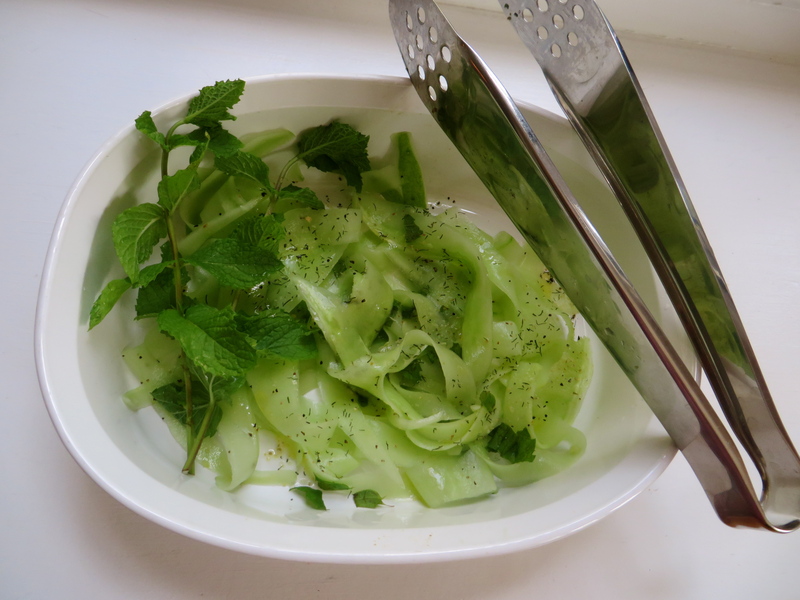 Thanks Naina, it’s such a great feeling knowing that these veggies had such tlc. Next PostNext Tea for Two and Two for Tea!